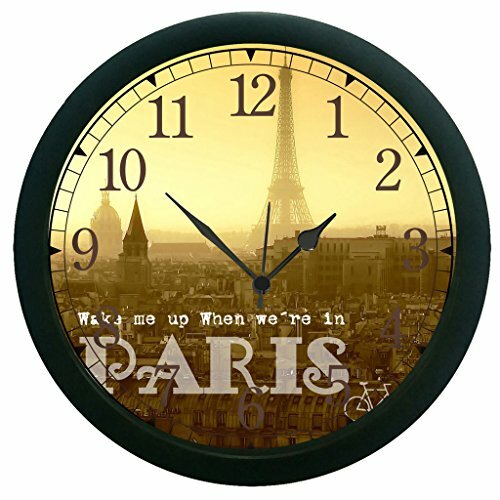 meSleep When in Paris Wall Clock (With Glass)@499 Rs [Mrp:-999] - Onlinedeals.discount - A leading product discovery website. Find the true prices of products, read reviews and buy top brand products at reasonable prices. meSleep wall clocks are made from High Quality Plastic Granules and Glass. It won’t fade or warp. Protected with a 12 Inch Plastic Frame and a glass top. Great for bedroom, kitchen, living and dining room or your office Dimensions: 30 cm diameter (12 inches diameter) Movement Type: Quartz, These wall clocks use a clock movement techonolgy that operates very quietly consume minimalistic amount energy thereby operating on 1 (one) AA Battery Number Of Batteries Required: 1, Battery not included.